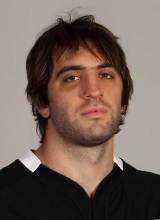 Lock Whitelock cut his teeth in the Junior World Championships in 2008 and made his debut in New Zealand's club competition soon after against Wellington for Canterbury. He had to wait until 2010 to make his debut for the Crusaders in Super Rugby and after impressing the All Blacks selectors he was called up to the All Blacks team for their mid-season internationals. He made his debut against Ireland from the bench and scored two tries in the process. He was heavily involved in the 2010 Tri-Nations series and continued his rise up the ranks with a series of strong performances on their Grand Slam winning tour of Europe in November 2010. He started both of New Zealand's Tri-Nations losses in 2011 but clearly did enough to impress Graham Henry and was rewarded with a spot in the 30-man squad for the World Cup. Whitelock went on to form a winning second-row partnership with Brad Thorn as the All Blacks were crowned World Champions for the second time.